We tried to observe the meteor shower of Leonids at Nov.18/19. We observed the meteor shower peak around 18h00m-18h30m(UT). This hourly rate(HR) was over 2000! After this peak, the number of meteors decreased slowly. But we could watch a lot of meteors in blue sky of twilight. Date  Time(UT)      min   Ls      h    Lm  Cl All Leo   HR  CHR  ZHR   Obs. *2:Limited magnitude was no-good because of twilight. Radiant place rised about 14:00(UT). Leonids meteor started before a few minutes from this time. The course of meteor at the time; about 14:00-16:00 was very long, so over 120 degree, from east to west. This night, we moved to this place from another place to avoid cloudy weather. So, starting time of observation was too late, we could not count the number of these long meteors. The meteors shower was starting already. The number of meteors increased slowly, but it was not the prediction of Asher, until this time. But the fire balls were many. We watched sudden increase meteors. Three or five meteors appeared at the same time, we got excited. Hour rate(HR) got over 1,000 at 17:35, and over 2,000 at 17:45. We felt the first peak of meteors around 18:00. HR was about 3,000. But a lot of meteors were not counted by us, the peak time might not be exact. Second peak was around 18:20. This time was near the time of prediction by McNaught and Asher. But the peak was not sharp, we could not decide exactly the time of it. Fire balls were not many so that time; 16:00-17:30. 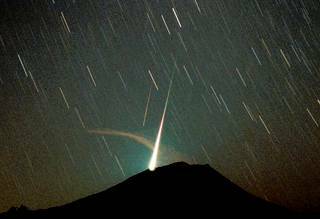 Sometime, meteors was increase, but the number of whole meteors got decrease slowly. Twilight startet at 20:00. But many meteors were still watched. We felt the rate of blight meteors got increase. We regret that we could not observe the end of Leonids shower. All Data of The Leonids Shower is here. Photo of The Leonids Shower is here. Mr.Chimura observed in Gunma pref. Home page is here. Mr.Watanabe observed in Nagano pref. Home page is here. Nekohora observed in Yamanashi pref. A train photo is same train of our site.Home page is here. Mr.Okamoto observed in Yatsugatake, Yamanashi pref. There are super slow shutter CCD images. Home page is here. Dai observed at his house in Tochigi pref. Home page is here. Mr.Imaishi observed by a digital camera at Kunitachi city in Tokyo met. Home page is here. Mr. ohno observed at his house in Ishikawa pref. Home page is here. By Kainan-Observatory (in Tokushima pref.). There are four movie files (MPEG). Home page (Leonids Live 2001) is here. By Kurashiki Science Center (in Okayama pref.). There are movie files (MPEG). There are result of Leonids in Chaina. Leonids 2001: Observational Results!